Who Can Look After Me? The period from 6 to 12 months, is an exciting time for your baby's development. This period can see babies developing from lying on their tummies or backs, to 'cruising' around on two feet supported by the furniture. They might even be walking! Your baby is still very interested in listening to the sounds of and emotion in your voice and loves to watch your facial expressions. Singing and talking to your baby is how your baby will learn how to speak. Special brain cells enable young children to absorb language simply by listening. The more your baby is surrounded by language, the more they will learn. You can tell your baby about what you are doing, when you chang their nappy, or about what will come next in the day. You can name things in your baby's environment to provide even more language. Your baby enjoys listening to you and watching your mouth move as your speak. When your baby watches your mouth move, their mouth will move too. Avoiding the use of a dummy will allow your baby to make these mouth movements and to practice making sounds. Keeping background noise down (e.g. the television or music) will mean that your baby can tune into your language. It is never too young to read to your baby. Very young babies enjoy colourful picture books with one or two words on each page. Your baby will be able to grasp a board or cloth book now and look through it with you, or by themselves. From 6 months onwards, it is all go! Your baby will reach each milestone in their own time. The developmental continuum looks like this. Young babies need lots of opportunity for free movement. Your baby will learn how to coordinate their movement and become stronger in their limbs if they have lots of practice time. A safe and comfortable space on the floor on a play mat will provide your baby with room to move. A large mirror lying sideways alongside the mat will give your baby an opportunity to watch their whole body move. Mirrors are also great for social interaction! Your baby is hardwired to achieve their movement milestones, Allowing your baby to practice new movements at their own pace will ensure that they build up the necessary muscle strength. Encouraging your baby to sit or stand before they are able to achieve these movements spontaneously could push them before their bodies are strong enough. Everything looks pretty different once you're sitting up! 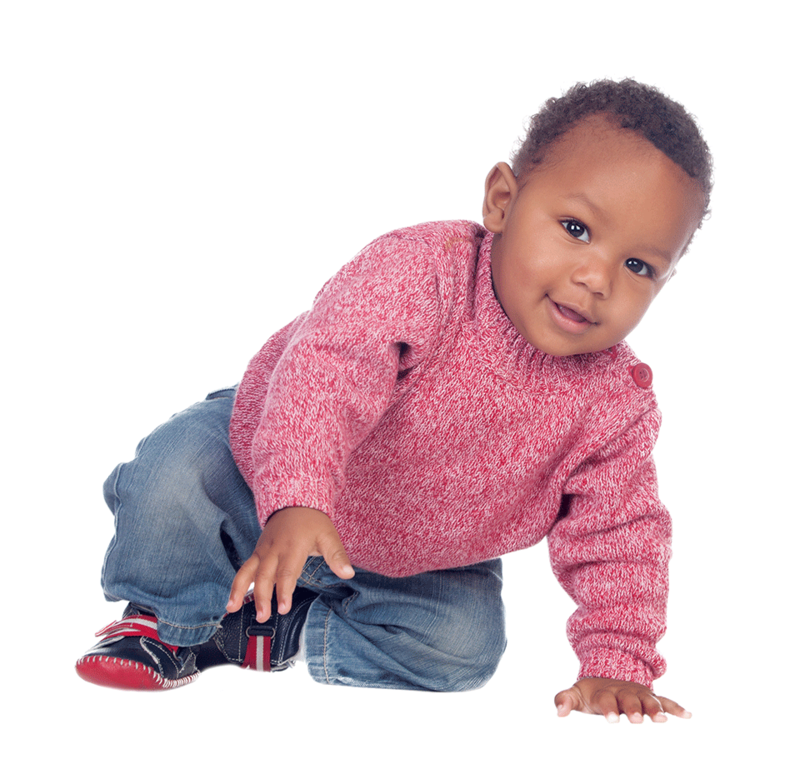 Your baby will need lots of opportunity to practice co-ordinating their eye-hand movements from each new perspective. The more practice they have, the stronger the pathway in their brain will become. When your baby is moving, have look at their clothing to make sure that it is not in their way. Loose or tight clothing can hold your baby up! The same is true for objects in their environment. Once your baby is crawling, their play mat might start to get in their way. Babies and young children need secure and loving relationships, which enable them to moderate their stress levels. These significant relationships can include the mother and father, other family members and also caregivers such as childcare workers. When your baby feels loved, this feeds their healthy brain development. Feeling loved and accepted supports your baby's emotional and social growth and development. Babies and young children recieve their information about how to behave in social situations by watching the adults in their lives. You are their role model.